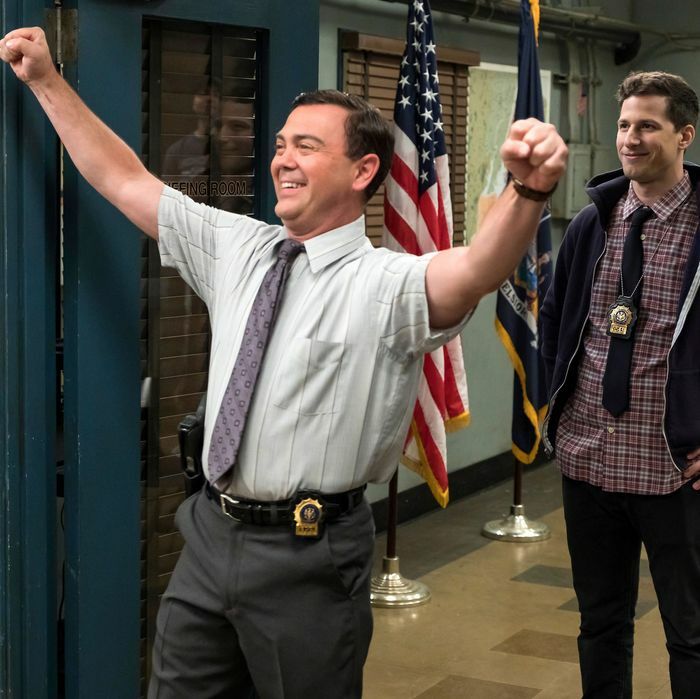 We’ve gone through a lot, squad, but maybe no one more so than Brooklyn Nine-Nine captain Dan Goor (official titles: co-creator and showrunner). In the span of about 24 hours, his show about the most lovable precinct in all of Brooklyn received notice that its current fifth season would be its last on Fox. News of the cancellation prompted an outpouring of grief on the internet as fans (including Lin-Manuel Miranda, Sean Astin, Mark Hamill, and Guillermo del Toro) went through the five stages. It turns out, behind the scenes, producers were working hard on the third stage of grief — bargaining — and eventually negotiated a last-minute save: NBC picked up the show for a 13-episode sixth season. We got on the phone with Goor after the NBC Upfront presentation in New York to talk about the emotional roller coaster he experienced when he got the call from Fox on Thursday afternoon that the show had been canceled and then another one Friday evening that NBC had picked it up. It might not feel as dramatic as how everything played out on Twitter, but hot damn, it’s just as satisfying. A lot has happened in a very compressed amount of time! Yes, that is not an exaggeration at all. I’d love to start from the beginning: How did you feel after you wrapped the fifth season? So the last few years, we had huge cliffhangers, and then this season, just because TV is such an uncertain business, we were very conscious of trying to make sure that our season finale wouldn’t destroy our fans if it ended up being our series finale. We felt a real obligation to make it something that has cliffhanger-y elements, but if god forbid we were canceled, it wouldn’t be a betrayal to the fans or to the show. It was a similar approach to what we did on Parks and Recreation, because Parks was always on the bubble, so we would write season-enders that in the worst-case scenario could be a series finale. So it sounds like the fact that you were on the bubble was on your mind when outlining the fifth season. It was on my mind, yes. A lot of the reps and execs were saying, “That’s crazy, don’t even think that.” The truth is, when we were on Tuesday nights at 9:30, our numbers were not spectacular. Nobody’s numbers are at that time. So I did begin to become scared. Again, the take-home should not be that we wrote a series finale. We did not write a series finale. We wrote a season finale that wouldn’t kill people if it ended up being the series finale. That was literally the goal: a series finale where you’d want to come back for another year. Were you nervous in the weeks leading up to Upfronts? The irony is, we were less nervous because once they brought us back on Sundays, it was a real vote of confidence. Then our numbers were pretty good. They were the same as The Simpsons, or not a tremendous drop-off from Simpsons and Family Guy. I actually became a little more confident going into the decision-making time, but still a little worried, because you’re always worried. So when did you get the call? In the week leading up, people in the know were saying, “We’re not sure what’s going on,” or “We think it’ll come back but we’re not sure.” So we were all starting to get worried. And then in the few days beforehand, it started to seem like a real possibility that we weren’t going to be brought back, but even still, we thought we would probably come back. It felt like the episodes had been really well-received. And then a couple of days beforehand, my agent said to me, “You should really be prepared that the show might be canceled,” and that was the first time anyone had said that word to me. Other people had said, “We might pass on you,” or “We might have to try to find a new home,” but “canceled?” It was like dubstep, where you hear BUUUUUMMMM! Canceled! Canceled! Canceled! I got a call on the day the announcement came out from the studio and then the network. It’s such a blur now, but the basic facts of it were they just weren’t going to put it on the schedule, that they loved the show and they were very sorry, but that was the way it shook out. All of the stuff that [Fox CEOs] Gary [Newman] and Dana [Walden] have said in the press is the same stuff they told us, that they’re making a strategic shift, and because they bought Thursday Night Football, there just aren’t as many time slots. They’re basically not doing single-cam comedy, it looks like. I don’t want to vilify Fox. We had five really great years there, and the executives’ blood, sweat, and tears were also in this show. I think it was really hard for a lot of them that the show wasn’t being picked up, and it’s clear that Fox has made a strategic shift. Seeing that these other shows were also canceled immediately cushioned the blow. It felt like, “Oh, they’re not doing that kind of show anymore.” At the same time, it was very shocking and scary and sad. You think, Oh my god, everyone’s losing their jobs. And also, I don’t get to do this thing that I love anymore. But very quickly, we were in talks about other platforms as possible new homes. What do you think is prompting that shift? I don’t know. I’m loathe to speculate. I’m sure the success of Roseanne is one thing, so therefore, the business behind putting us on the air is different than if they owned us. Multi-cams are less expensive to make. There are a lot of business decisions that contribute to it. But I really don’t know. They make the decisions they make. So what did you do after the phone call? True story: I was in the bathroom when it came, so I finished up! [Laughs.] I talked to Andy [Samberg] and [co-creator] Mike [Schur] and to [executive producer] David Miner, and we immediately started game-planning. A lot of this stuff is David Miner and Pearlena [Igbokwe], who runs the studio. They are really the ones who know “what happened.” They immediately were great defenders. Pearlena is a real hero. She took it upon herself to make sure that we found a new home, and they were in talks at a few places. And then Tracy Pakosta helped at the studio when we developed Brooklyn. This is, in a lot of ways, her baby and it always has been, so she was eager to bring us to NBC. She was another person who really worked to make this happen, and so did [NBC Entertainment Chairman] Bob Greenblatt. There are a lot of considerations when you move a show from one network to another. It’s not easy, and we’re all so unbelievably grateful. So from the moment of the cancellation news, you had people ready to go. Right. We felt the show was profitable, so it felt like the studio would want to keep making it so they make money. Even before it got announced we were starting to talk to places and look for a new home, and then the internet exploded and there was so much support. I mean, every single member of the cast and crew and production staff, we were all blown away by the level of support, and I think that that helped a lot, and it also cushioned the blow a lot. NBC also had to consider where it would go on the schedule. How many episodes could they do? What would the budget be? There’s all kinds of things like that that go into this consideration, so it’s not as simple as, “Bob just has to say ‘yes.’” All through Friday, we were on the phone and texting one another. I was at my daughter’s track meet, and then all of a sudden, I read on the internet, just like everyone else, that Hulu had dropped out, and I thought, “Oh no!” I was demoralized. I really thought Hulu would be our most likely option. I had guessed that if we were to go anywhere else it would be Hulu because of The Mindy Project going to Hulu, so it felt like there was a roadmap for that. When did NBC become the frontrunner? Bob [Greenblatt] has always said, for the last five years, every time I’ve seen him, “I really love Brooklyn. I’d love to have it on NBC.” So, I shouldn’t have been surprised. And then at 8:00 p.m. we got the call that NBC was going to pick us up, which was unbelievable. I just rejoiced, and Andy and I were just texting each other, so ecstatic. They told us they wanted us all to tweet about it at 9 p.m. and we did. It was a very, very happy moment. The uninteresting truth is, I was so shell-shocked by the whole thing, and then I was removed, and then I was in action mode, so the fact of its cancellation didn’t really sink in. I did go out with [Brooklyn Nine-Nine executive producer] Luke Del Tredici and we did have a drink Thursday night. That was really the first hint that maybe it was going to be over, but the truth was, I was privy to the fact that there were talks with these other places. For our actors, I think it felt much more final. For me, it wasn’t yet final. I had some hope, but it was also like, “Oh god, this really could be over.” And again, the Twitter response was like, “Oh, wow, people are really responding to this.” And every time I refreshed it, I was getting tens of thousands of likes, which was crazy to me! And everything Terry [Crews] and Melissa [Fumero] posted, and then all of a sudden Lin-Manuel Miranda, Sean Astin, Mark Hamill, Guillermo del Toro. You should have Guillermo del Toro direct an episode! I’d love it! He can direct “Halloween”! I’d love that. I don’t know if it’s possible, but I love that. And Lin-Manuel Miranda should play one of Amy’s brothers! It was just this crazy, overwhelming, heartwarming thing! And the thing that was really nice also was the things people said about the show – they were reacting consciously to the elements of the show that we try to make, but also try not to wave our hands and say, “we’re doing this.” People really responded to the fact that it’s a very diverse cast, that it feels very inclusive, that the jokes aren’t at the expense of characters. Those are all things we try to do and it was really heartwarming to see those were the things people liked about the show. Yeah! Well, we try to make it close enough to our world that maybe our world could be like that! One of the more difficult things about writing the show is that the characters get along, so it becomes difficult to create conflicts. That was the thing we really struggled with the first few years in the writer’s room, coming up with stories about how much conflict should be between them, and how deep-seated it should be. And then eventually we realized that was what was special about the show, so we stopped fighting it. Do you think the Nielsen ratings are an accurate way of measuring Brooklyn Nine-Nine’s viewership? I do think a lot of your viewers are of the cord-cutter generation and watch the show online. That’s right, and the person I’ll get in trouble with for this interview is Andy for having suggested that we were low-rated when we were on Tuesday nights! Our live same-day ratings were not great. Tuesday at 9:30 is a school night, and it’s just not a great time for us to have live viewing. But the fact of the matter is you’re right. People don’t watch TV the same way, and our show had good viewership numbers when you looked at the live plus threes and plus sevens. Hulu doesn’t release its numbers, but I’m under the impression that we do very, very well there. But from a Fox perspective, they don’t own the show, so the show doing well on Hulu or internationally isn’t necessarily relevant to their business decisions. Greenblatt has said that he thinks Brooklyn Nine-Nine is a better fit at NBC anyway. Would you agree? I don’t want to slam Fox in any way, but I think we are a great fit at NBC. I mean, Mike Schur is a co-creator of the show and he has two other comedies there, one that he created and one that he’s executive producing on this next season, so it’s certainly easy to see that we are a great fit with NBC. We’ve always had a similar comedy sensibility. How did the cast react when you told them you had been picked up? That’s one of the most ecstatic experiences I would say I’ve had. I mean, it was all done over email/text because it was late at night, but subsequently I’ve seen them here at Upfronts, and because most of them weren’t privy to the story of what was going on, all the emotions played with a greater magnitude than they played for me. It’s been nice. They are so happy, and they are so happy to be at NBC, and they’re so happy to be together, to be doing more of the show. It’s really nice to see. If you look at their red carpet photos, they’re just ecstatic. Terry [Crews] had a funny story. He was on the east coast and he was asleep already when I emailed them that the show was getting picked up. He woke up in the middle of the night to go to the bathroom and he read the text and he was like, “Oh my god!” and he freaked out in the middle of the night and started tweeting about it! How did the decision to only do 13 episodes on NBC come about? Did you want a 22-episode season? I’m very happy with 13 to be honest. It’s really great. It’s really hard to make TV, and 22 episodes is almost impossible, so I was praying for 13. Even if we stayed at Fox, I was happy to have 13. We’ve done 112 episodes, so with 13 it will be 125 and it seems more livable in some ways. [Laughs.] Drained! I feel so drained. But I still feel really, really grateful to the fans and I feel really grateful to NBC. It’s a good place to be. Being born is nice, being reborn is really nice. I always love the moment that a project is OK’ed before you actually have to start doing work on it! This is the ultimate version of that. Exactly! It’s the Platonic ideal! There’s nothing to sully it yet. That’s not a very positive way of saying it, but it’s only joy right now. Not to sully that in any way, but have you thought about the next season? It’s one of my favorites, too. Luke wrote it and he did a masterful job. And “Show Me Going” to a certain extent, where we did the A-story trying to pass the Bechdel test [with] Amy and Rosa, and instead Jake and Terry were in a wedding-related B-story. We’ve tried to do some more interesting emotional issues episodes, like Rosa coming out. The other thing we learned about “The Box” was doing a tight, procedural episode. We may end up doing an arc that is more of a plotted, police case arc. It’s still Brooklyn Nine-Nine with comedy first, but we might try to challenge ourselves that way.